"This bread is very light and rises high." Place ingredients in the pan of the bread machine in the order suggested by the manufacturer. Set for Basic Bread cycle, or Normal setting. 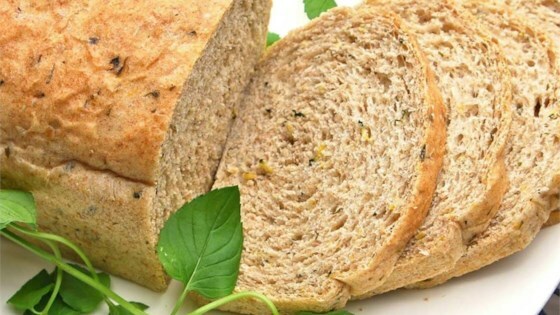 This rich, hearty loaf is great for breakfast or snacks. I made this with my big mixer.It is a good bread,but next time I will use rosemary and thyme instead of basil.Cheese could be added also.I doubled the recipe and it made two nice round loaves . Nice as an alternative to the sweet zucchini breads. Subtle flavor, very light. I used 1 tsp. dried basil, and got good results. Will use this one again. Completely enjoyable. Light and tasty. A real winner. Best bread ever! I just add the zucchini without measuring but follow the recipe otherwise. I've made 2 loaves today and will make more to give to all my friends!